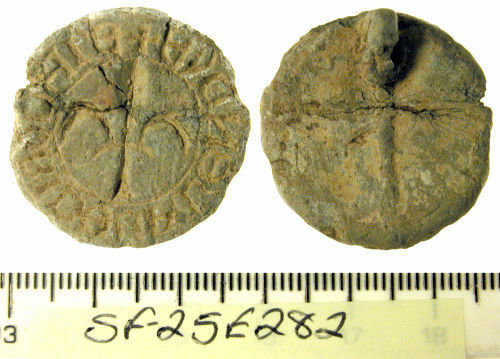 A cast lead seal matrix of Medieval date. It is circular in shape and flat with a sub-rectangular attachment loop on the reverse. On the face is a central fleur de lys within a circle with the legend S'IPALENDB+ surrounding. It measures 27.43mm in diameter, 3.23mm in thickness and weighs 14.07g. Copper ally vessica seal matrix, with reverse lug and loop. Central motif depicts a fleur de lys, with legend surrounding.